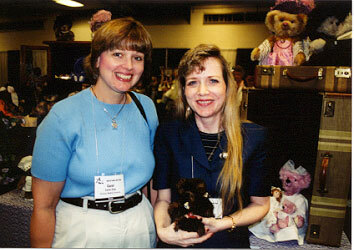 Carol was very impressed with Gretchen McKillip's five-inch, jointed bear named "T.R. & Berry". 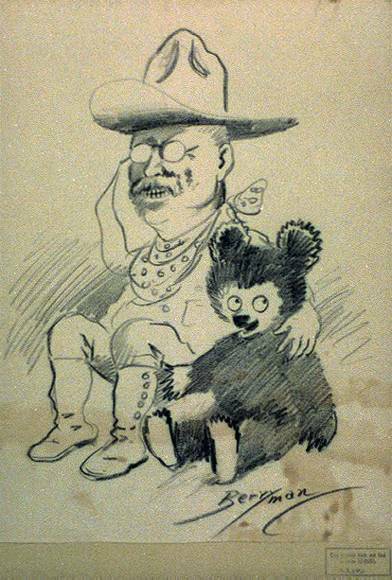 This creation was a "Teddy Bear Review Magazine" contest winner of the Theodore Roosevelt commemoration of the 100th anniversary of his inauguration as president of the United States. President Roosevelt's great-grandson, Tweed Roosevelt, kindly offered to select the winning bears. Gretchen lives in Walla Walla, Washington. The mohair bear has wool-felt pads, onyx eyes, wired arms, and is stuffed with polyfill. 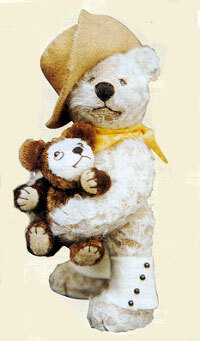 The smaller bear doll in his arms is 2 1/2 inches in height. 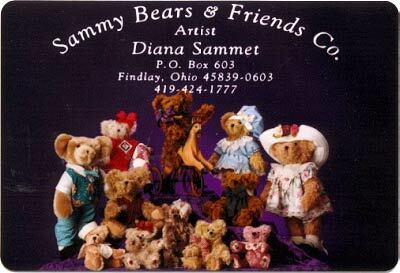 Diana Sammet of "Sammy Bears & Friends"
Diana Sammet of "Sammy Bears & Friends was Carol's favorite choice at the show. 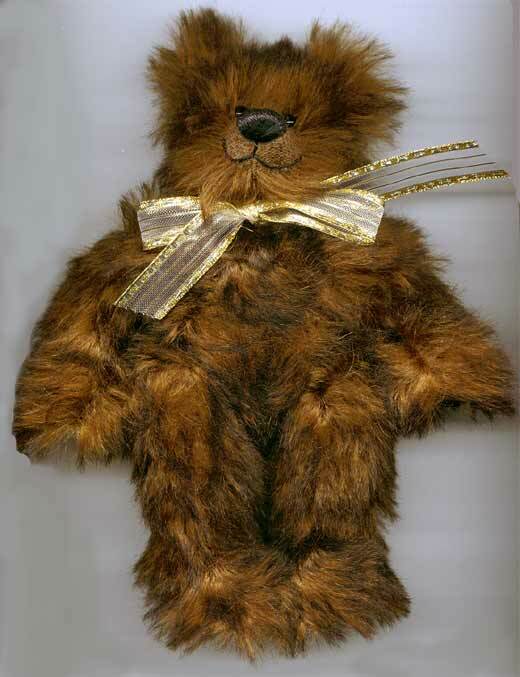 Diana's "Chocolate Caramel Cheesecake" mohair bear is just adorable. He 8 inches tall, has glass eyes, ultra suede paws, and a hand embroidered nose. He is filled with love. Carol and Diana are shown to the left. Chocolate Caramel Cheesecake is shown below. 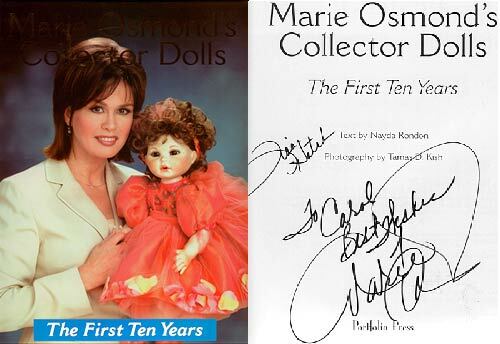 Below: Marie Osmond sends Carol her "Best Wishes" as she signs her new book about the first ten years of doll making. It is quite a story! 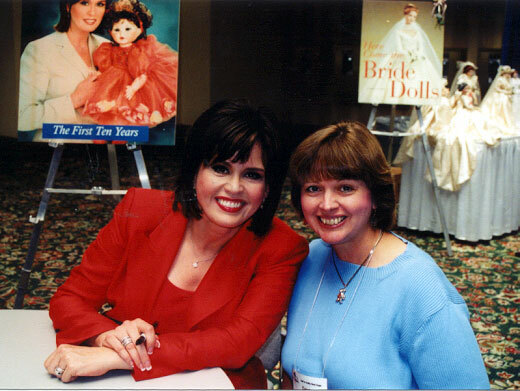 Below: Carol met Marie Osmond at the show. They reminisced about all the fun they have with their hobbies.